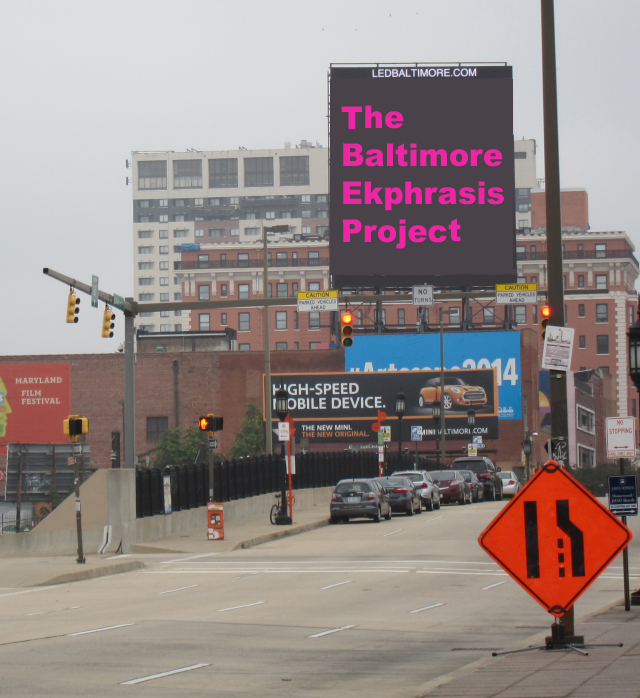 The Baltimore Ekphrasis Project is a collaboration between LED Baltimore and The Light Ekphrastic, scheduled to run on the Baltimore LED Art Billboard in March 2015. Sixty-six Baltimore-area writers and artists have been chosen to create new work inspired by the work of their partners. Final written works will be presented as excerpts on top of art on the LEDBaltimore Billboard, and in full in a special online issue of The Light Ekphrastic. See the special issue online here! Cheryl Fair and Dave K.
Using the piece submitted by your partner as inspiration, you will create a new piece of art or writing, to be submitted to jennyogrady@yahoo.com by midnight, Saturday, February 28. When shown on the LED billboard, writing produced will be presented on top of the image that inspired it. Editors will choose the excerpts. Please remember that all artwork and writing should be appropriate for outdoor public consumption (i.e., no nudes, no politics, no foul language). Editors reserve the right to refuse submissions based on these rules. Writers: Written works should be 1,000 words or less and submitted as a Microsoft Word or .txt document. Artists: Images must incorporate a large “blank” space over which text might appear (treetops, sky, water, color blocks, etc.) and must follow these specs: Dimensions: 1536H x 1280W Color mode: RGB DPI: 72 File type: JPEG. Questions? Contact Jenny O’Grady, editor of The Light Ekphrastic, at jennyogrady@yahoo.com.